So, the clown. His name is Pennywise. His face is the color of ash and his lips the color of blood. He menaces early on in IT — bursting onto the scene with all the abruptness of a jack in the box — by pretending to play nice with a sweet boy. Poor little Georgie never saw it coming. Make that IT coming. Pennywise, you see, is a nameless, faceless demon able to take on different guises. Even when IT isn’t on screen, the possibility of its sudden presence looms. IT waits and then IT festers. And IT ups the ante on an otherwise moderately scary thriller that kicks off the fall movie season. It’s true. (Ugh, this pronoun is already a problem.) Based on those trailers, I was convinced I’d watch the movie while cowering in a corner of the screening room. But I held it together, and I suspect you will too. Pennywise’s entrance aside, the gotcha frights are easily telegraphed. Though IT originated from the twisted mind of author Stephen King, this is a riveting coming-of-age yarn that centers on the horrors of being an adolescent. Irrational fears are shining bright. Rejection cuts straight to the heart. But loyal friends that stand by you and help carry the load can make all that the misery more tolerable. Besides, how traumatizing can a movie be when two characters have full conversations about a bubble-gum pop group? They call themselves “The Losers” — and during the summer of 1989, this band of misfits have trouble hangin’ tough in the cheery town of Derry, Maine. Bill (Jaeden Lieberher, Midnight Special), the de facto leader who happens to look exactly like a young Wil Wheaton, is still rocked by the disappearance of his younger brother, Georgie. He stutters. The Losers also feature a hypochondriac, a class clown and an overweight new kid. One of the town’s only Jewish kids. One of the only black kids. The gang’s sole girl, the red-headed tomboy Beverly (Sophia Lillis), is beaten and possibly more by her creepy single father. They’re all cruelly picked on, neglected and abused. And together, they’re unlikely heroes. Uh-huh, these Losers are onto IT. They’ve each experienced scarring encounters. One member has done impressive research and concludes that the town’s eerie reputation for missing children stems from this mysterious creature. No ordinary boogeyman, IT specifically festers off kids’ fears, frustrations and hate and then swallows them whole. If they can use their positive powers to defeat IT, they’ll be free — same for future generations. Maybe. Unlike most villains, IT is not hidden in plain sight or lurking in the shadows. IT is just there, capable of forming everything from a leper to a deranged woman. Some of its “disguises” don’t quite jibe with the narrative and are weird just for the sake of being weird — I’m still unclear why IT speaks to a B-grade character through a television set. (Nod to Poltergeist?) The relative unknown Bill Skarsgard (son of Stellan, younger brother of Alex) pushes his prey’s buttons with subversive delight. Smart casting choice: A familiar actor even in disguise would have distracted from the story and, er, killed the suspension of disbelief. Skarsgard’s high-pitched squeal alone is a thing of sinister beauty. IT is strong. The Losers are stronger. I think this development is a mixed blessing. In horror movies, I believe there’s nothing more heart-pounding than a hero or heroine facing a villain 1:1. All the barriers of protection are gone and survival instincts kick it. This is where IT excels — a haunting scene involving Beverly and a bloody bathroom is reminiscent of the original A Nightmare on Elm Street. 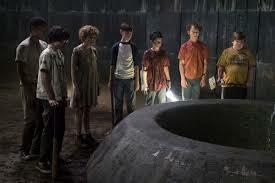 But every time the kids hang out together or go on field trips to IT’s lair, the sense of imminent danger vanishes. It’s difficult to juggle yuks and shocks, and IT can’t quite pull it off. I must admit that the Stranger Things Factor may be the reason. I’ve buried the reference on purpose. King published IT back in 1986, years before Stranger Things‘ young cast were born and before veteran star Winona Ryder became a Gex X icon. Even the brilliant author couldn’t have crafted a scenario in which a Zeitgeist, Emmy-nominated Netflix(!) series would premiere 30 years later and also chronicle offbeat ‘80s preteens joining forces to solve a haunting local mystery. Comparisons are inevitable. Actor Finn Wolfhard is part of both cliques! And in some ways, Stranger is better. In IT, for example, the period jokes are perpetually shoehorned. (I was 13 in the summer of 1989 and can vouch that Lethal Weapon 2 was not a must-see.) And The Losers’ comic adventures feel a bit off-key. 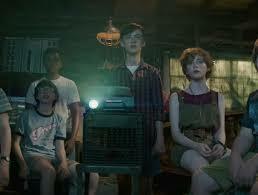 In retrospect, I wonder if director Andy Muschietti (Mama) would have set his film in present day. He certainly takes other bold and intriguing other plot liberties of which I approve. I’d say more but I sincerely worry Pennywise will devour me.